Although it might not get as much fanfare when compared to some of the frenzy surrounding major product launches we tend to see from Apple, we’re actually on the verge of seeing Apple grand opening one of its latest retail stores in New York City. 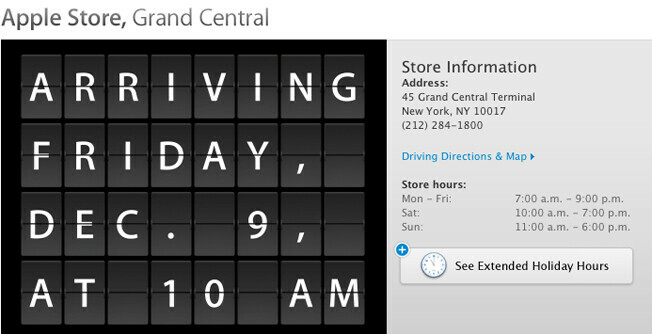 Specifically, the Grand Central Station Apple Store is set to officially open for business starting this Friday, December 9th when the clock hits 10:00 AM EST. That’s right folks, if you happen to be around the hustle and bustle area of Grand Central Station, you can find the new 23,000-square-foot Apple Store on the East Balcony of the station’s main terminal. Rather than being a 24-hour hotspot, like the Apple Store on 5th Avenue, this one is actually set to close its doors at 9:00 PM Monday through Friday, 7:00 PM on Saturdays, and 6:00 PM on Sundays – thus, giving its employees some much needed R&R. Fortunately for the many New Yorkers around the area, the store is going to be a reality very soon seeing that Apple reportedly agreed to a 10-year contract with the MTA.